I've been working on a little homebrew expansion for a favourite ship of mine, namely the USS Typhon from the PS1 game ST: Invasion. 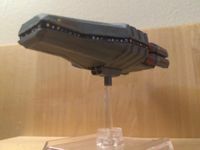 For those not in the know the Typhon was a "Mobile outpost and carrier starship" equipped with squads of Valkyrie fighters. I've got someone working on a model I can get 3D printed but for now here are the cards (there's probably some iffy wording and errors in there, along with flagrant balance issues, but these are V1). The Typhon class is pretty slow and poorly maneuverable...I couldn't realistically give that massive box a nippy maneuver set. It's also not a heavy hitter itself, rather its intended to support squads of fighters. You'll also notice that it has a new type of upgrade slot. The fighter upgrade. I haven't made the reference card yet but for each fighter slot you can purchase a single attack squad (ignoring uniqueness restrictions) as an upgrade instead of a resource. This particular Worf is quite clearly geared towards a fighter swarm strategy. The hangar bay upgrade is designed to allow you to add yet more slots to the Typhon or to allow you to refit other ships into carriers themselves. While the advanced hangar bay upgrade allows you to perform repairs on the fly. Fortress mode and pulse phaser turrets are here to mimic the games obligatory "Lets do turret missions" sections (the picture on the turret card is in fact from Elite Force 2's obligatory turret section as Invasions were too low res). Another new toy are "Squad Leaders". You purchase them as a crew upgrade for your carrier ship (again, this is pending a reference card, the intention is they HAVE to be bought for the same ship as the fighter) and at the start of the game assign them as (effectively) captain to an attack squad (their captain skill number is only used if the squad would drop below that number). First up is Cooper, player character of ST: Invasion. He is designed as a dogfighter (as you spent most of the game dealing with rival fighters). Then we have two others pulled from elsewhere (given I cant remember there being any named pilots other than Cooper in the game). Wesley Crusher (not sure where I found that picture, credit to random internet person) and Nicholas Locarno of Red Squad (yes I know that's Tom Paris in a holodeck US army uniform...all the shots of "actual" Locarno just look like Tom as theyre in the same uniform). And finally the Valkyrie fighter squad (intended to be purchasable as a resource OR as a fighter upgrade for a carrier ship). They differ from the standard federation fighter in that they can take a single weapon upgrade (same movement as the standard fed fighters). Critique is very much welcome and I'll post an update at some point when I have fixed the inevitable errors and cleaned up the wording and when I have the Typhon and Valkyrie models to show off. I think you might want to add some other captains, Worf to me doesn't seem like a fighter carrier commander. I do like the ability that you created. I know he seems a tad out of place but he was in fact captain in the game, i think primarily due to Michael Dorn's willingness to do video games, and the desire to have a recognizable voice. Hence why he was captain of the "definitely not the Defiant but its a defiant class with a cloaking device with Worf in charge for rights reasons" in armada 1. The only other captains in the game were Picard and "random renegade starfleet guy" on the Sentinel (some kind of refit Sovereign class which I might make later). I might try for a second captain (or a captain card for cooper), if I can find some vaguely appropriate art. Your hanger bay upgrade is pretty similar to how I'm doing hanger bays in our conversion. If you've got a guy who's good at converting/ripping game assets, let me know if you'd like to join forces on our project. I've still got a couple of game assets I've had no luck ripping myself. Actually the Typhon and Valkyries I'm getting made are scratch builds a friend is making (everyone should know at least one person prone to bouts of arts and crafts and delicious delicious bakery) and I'm gonna try and run through shapeways (although if it comes out well I do intend to release the model files and updated cards). I gather it may be possible to obtain the originals from the game files but they'd be severely low quality and a lot of work to get to the level of detail you have in attack wing models. Depends on the game, but in this particular case yes. Other games work great. I can give you some Shapeways tips if you haven't used them for this sort of thing before. That would be most welcome, I've not used it before at all. The Ultra Frosted Details will give you the best looking output, but it's extremely brittle. 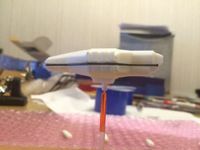 On medium sized models, things like nacelle pylons will break the first time it's dropped on the floor. Really small models are a little more forgiving since there's less mass/weight hitting the floor. The various Strong and Flexible materials probably match the retail game pieces for durability. 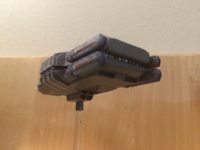 However there's two downsides, you loose surface details (if the model has any) and it has a thicker minimum wall size, meaning things like nacelle pylons will have to be thicker for them to print it. 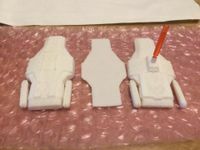 Assuming you are going to be painting them, I prefer the finish on the "Polished" Strong and Flexible materials and the cost difference is minimal. That said, the Typhon itself is largely just a brick so it's probably not going matter on that. The fighters may take a little bit of work to get usable. If your 3D guy isn't used to working with 3D printable models, you (or him) may want to pick up netFabb to do some repairs and scaling on the model. It's very easy to work with. Is there an ability to launch fighters? Or do the fighters and carrier all start on the board.The ability to launch fighters as an ACTION would seem to be a key part of the battle. I can't speak for his version, but in my case, yes the "carrier" spends an action to launch a fighter wing out the rear of the ship. It can spend an action to "dock" a wing at range 1. In this instance they start on the field, they just go into the battle WITH the carrier, assuming it had deployed in the minutes leading up to the fight. While launching and returning fighters would be a nice thing if games were longer (or in some kind of campaign game, which would be a fun thing) it seems like a little much for the length of an AW game. Theres meant to be a little hint of fighters coming and going from the Enhanced Hangar Bays upgrade. It does cross my mind that another ship upgrade could be a defensive fighter that exists only as a token on the ship and is launched as an action (maybe a combination of a 1 hit redeployable ablative armour combined with the counter attack dice....it soaks up a hit heading for the carrier and/or deals some damage). Wow, Danny - this is great stuff! 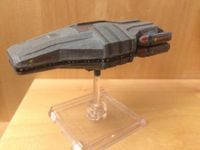 I was the scriptwriter on the Star Trek Invasion videogame and I'm an Attack Wing player - so it's very cool for me to see ships I helped to create nearly 15 years ago coming to life in STAW! Regarding your comment about Valkyrie pilots, there was one other pilot named in the game - Ensign Turner, who is mentioned in the two-player sections. Now there's an unexpectedly cool turn up! Don't suppose Turner had a first name? I then assembled and painted it. Small Shapeways prints (especially the high quality stuff) is quite fragile. Maybe not to drop but trying to mount on a stand is pretty frustrating. I like your cards but I don't think fighters belong in this game (and yes I have Fed and Cardassian fighters and have played them so this is a little hypocritical). I just don't think it's a natural fit. That said, pretty good job and be sure to report how your cards play and tell us what you play against!